Removing the testicle is usually the first treatment for testicular cancer. Your surgeon usually removes the whole testicle. The operation is called an orchidectomy or orchiectomy. This is also used to diagnose the cancer. Your doctor can put a false testicle in place of the missing one so it looks the same afterwards. This is called a prosthesis. In some men with very small tumours the surgeon removes only part of the testicle but this is very rare. It is called a partial orchidectomy. Having a testicle removed might reduce your chances of fathering children. Talk to your doctor if having children is important. They might suggest sperm banking before having surgery. The operation normally takes about 30 minutes. The surgeon makes a cut in the groin and cuts the spermatic cord to remove the testicle. They might also remove nearby lymph nodes and a small gland called the seminal vesicle. The surgeon sends the removed testicle to the laboratory for examination under a microscope. It takes a few days to get the results. Lymph nodes form a network of glands throughout your body. Cancer can spread to the lymph nodes and make them bigger (enlarge). 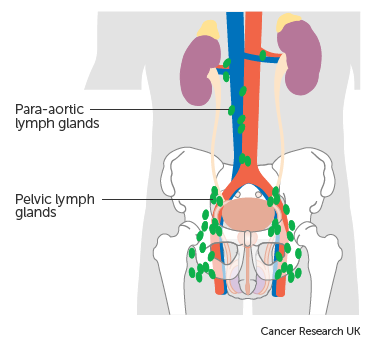 In testicular cancer this happens to the lymph nodes in the tummy (abdomen). After chemotherapy or radiotherapy for non seminoma cancer you might have an operation. This is to remove any remaining large nodes in your tummy. The operation is a retroperitoneal lymph node dissection. You have this surgery under general anaesthetic. It can take between 3 and 7 hours. You may need to stop eating and drinking for a few hours beforehand. You may have a drip. More rarely, you might have surgery to remove lymph nodes in your chest. This operation is called a para aortic lymph node dissection. 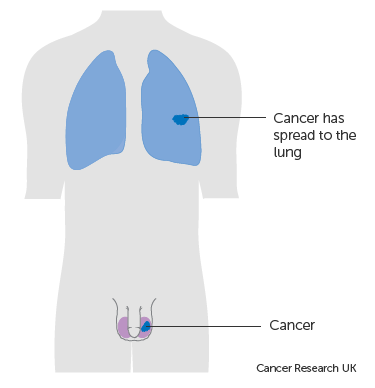 If testicular cancer has spread to your lung you might have surgery to remove it. This is major surgery that you have under general anaesthetic. You have a drip into your vein and tubes coming out from your wound. Surgery to the chest always makes the lung collapse. You have a tube into your chest for a few days. The tube connects to a suction bottle. It helps your lung expand (inflate) again. The surgery might involve cutting through some ribs. This can be painful while it heals. This surgery can be done more than once if the tumours grow back again. This will depend on how fit you are and how much treatment you want to have.